They're back. 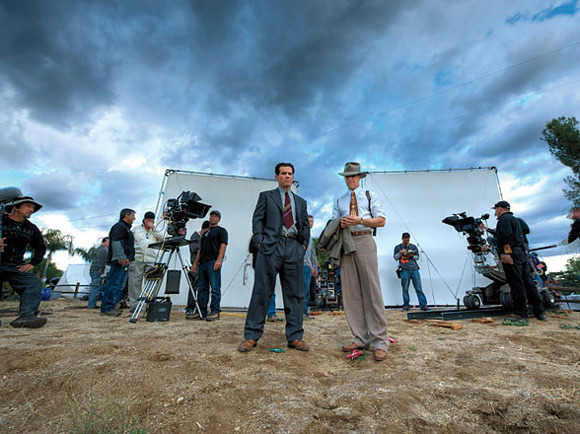 While we wait to see another trailer for Warner Bros' Gangster Squad, directed by Ruben Fleischer, in the meantime we've got a handful of badass behind-the-scenes photos that are a must see for anyone who loves the process of making movies (which should be everyone). 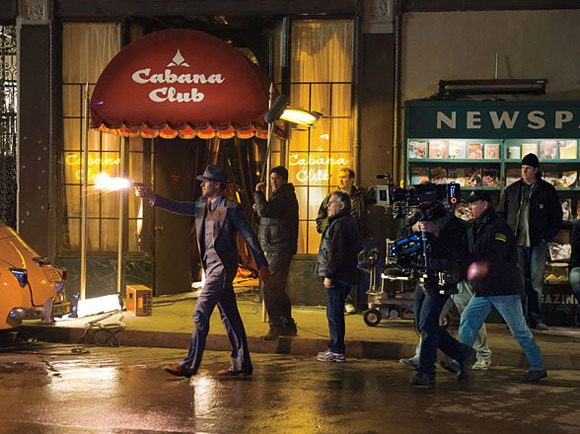 The elegant W Magazine (via tip from Daily Blam) has just published a photo editorial entitled "On Set: Gangster Squad" that boasts a gallery of eight behind-the-scenes images with quick director's commentary. Josh Brolin, Ryan Gosling, Emma Stone and Nick Nolte star in the film, and appear "at work" in these excellent shots. Take a look! 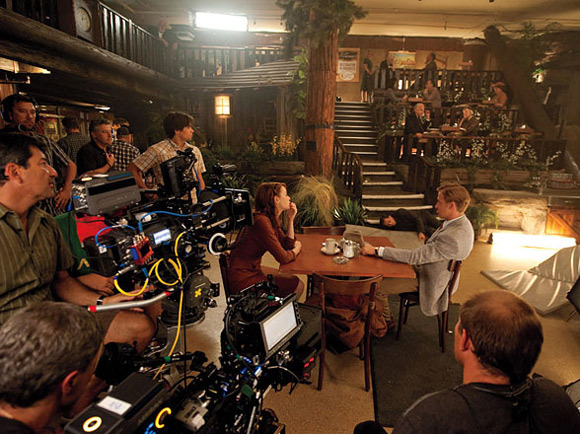 Here's some of the behind-the-scenes Gangster Squad photos, originally from W Magazine. 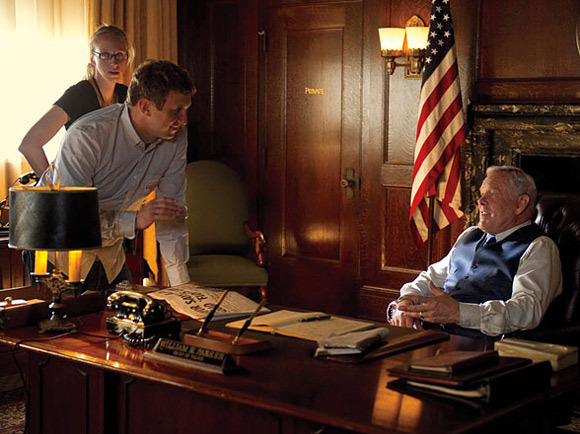 Commentary underneath each comes straight from director Ruben Fleischer, explaining what's going on in each photo. A police chase ends with a crash through a skylight and directly into this studio during a pinup shoot with Bettie Page (played by Nancy McCrumb). Photographs by Wilson Webb. In this scene, Ryan Gosling's character, Jerry Wooters (a cop), introduces himself to Grace Faraday, played by Emma Stone. Obviously they have great chemistry. [Ruben Fleischer] and Nick Notle, who plays the police cheif, Bill Parker. In the script, he's likened to Richard the Lionheart. Only Nolte could pull that off. One of my favorite locations: Clifton's, a real restaurant that's been in Los Angeles since the thirties. A time warp. It was hard to re-create vintage LA—there are so many tall buildings now. We had to go to the outer reaches of the city, to neighborhoods like Sylmar. A turning point for Gosling's character: A little kid gets killed by Cohen's assassins ina shoot-out. This is when he decides to get on board—as it says in the script, "the long-sleeping cop comes to life." The full squad: Brolin, Robert Patrick, Anthony Mackie, Michael Pena, Gosling and Giovanni Ribisi. Six amazing actors—and some of the funniest dudes ever assembled. “It's been a while since people really fell in love with an American gangster movie." In Gangster Squad, the LAPD fights to keep the East Coast Mafia, run by Mickey Cohen, out of Los Angeles in the 1940s and 50s. Gangster Squad is being directed by Ruben Fleischer (of Zombieland, 30 Minutes or Less) from a screenplay written by Will Beall ("Castle"), based on Paul Lieberman's book. 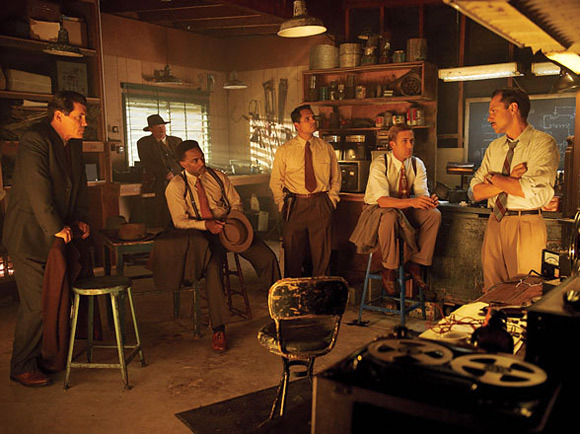 The cast includes Sean Penn as mobster Mickey Cohen, along with Brolin, Gosling, Peña, Patrick, Mackie, plus Giovanni Ribisi, Frank Grillo and Mireille Enos. The film shot late last year on location around Los Angeles, but was delayed after the July theater shooting. Warner Bros will instead release Gangster Squad starting January 11th, 2013. I kind of wish I wouldn't have looked at those.